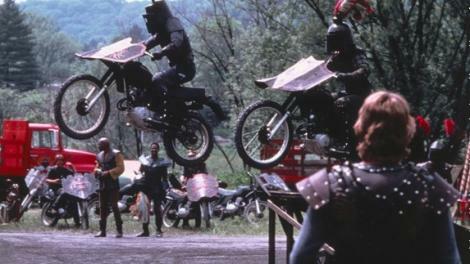 Knightriders (1981) – Winning. Words. “It’s a pretty bizarre little movie,” surmises Ed Harris in an interview included on this Knightriders restoration. “It’s unlike anything George did or has done.” No kidding! Sandwiched between Dawn Of The Dead and Day Of The Dead (via Creepshow), George A. Romero’s medieval motorbike mash-up is a beguiling blend of two-wheelers and tantrums. Harris is riveting as the king of a medieval re-enactment troupe whose disillusionment and fiery temper threaten to tear his kingdom apart.